Never gone rock climbing outdoors or indoors, then this is for you! Learn the basics and after this adventurous course, you will be able to pass any gym’s belayer test. Mankind's underdeveloped climbing skills and inability to digest tin cans are two ways in which evolution left humans inferior to goats. Level the playing field, learn climbing basics, such as rope skills and belaying, during an introductory climbing course. Washington's terrain makes the state a climber's paradise and the perfect place for a rock climbing hobby and there is no better time to start than the present. We have three locations in Washington State for you to choose from, Mt. Erie in Anacortes, Little Si or Mt. Washington near Seattle, or the crags near Bellingham. There is something here for everyone, routes can be as easy as climbing a playground or for those who want to push their limits we have something in mind for you too. Skills you will learn: Checking equipment including rope, harness and shoes, knots, safety procedures, rappelling, Top-rope belay technique with multiple belay devices, catching your falling partner, practicing taking falls yourself safely and correctly, rock climbing communication, basic rock climbing technique and body position, lowering climbers and coiling rope. By the end of this course you will be able to pass any indoor gyms belay test. 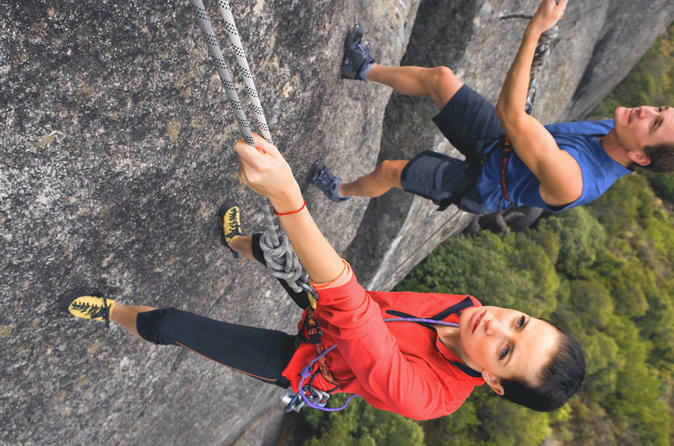 Included: Professional rock climbing guide/instructor, all equipment and certificate upon completion. Not Included: Snacks, drinks and appropriate clothes. General athletic clothes will do! Equipment: All climbing equipment will be provided for you.